Cheerful Char is a locally owned business in Winchester, employing domestic cleaners to provide you with a wide range of house cleaning and ironing services within your home. We are equipped with a comprehensive cleaning kit comprising all the cleaning products and equipment necessary to complete house cleaning tasks, prioritised to your requirements and expectations. From only £29.95 for a 2 hour visit, you can expect to see the same individual returning on a scheduled basis or, for a one-off visit, a selection from one of our group of competent domestic cleaners. Established in 1988,we have over 25 years experience of employing and training domestic cleaners to work in private homes within the Winchester area. Each of the cleaners will have been interviewed in their own homes, with both work and personal references sought before final selection is made. Personal integrity is our main consideration such that we always recruit on the basis of suitability rather than availability. 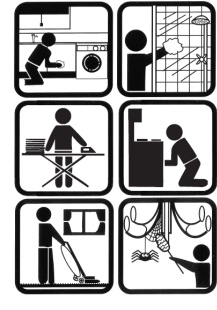 Insurance cover for both public and employers liability is provided for client's and cleaners peace of mind. Our range of domestic cleaning services is broad, embracing regular visits, 'one-off' end of tenancy cleans and spring cleans - you supply the reason so we can provide the complete domestic service! Michelle has done a really great job the last couple of weeks." "Thank you so much for the work Penny did ...I was more than pleased with the results." "With thanks ...She really was wonderful." Please call us on Winchester (01962) 842141 to discuss your requirements or arrange for a no obligation house visit to discuss priorities and preferences. We can also send you a brochure that you can consider at leisure or for the consideration of a third party.